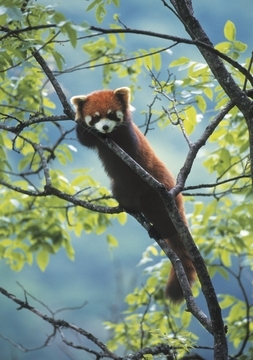 The red panda (Ailurus fulgens) bears little resemblance to the well known giant panda, and in fact, the two are only distantly related. This little guy looks more like a cat than a bear, and its closest relatives are actually raccoons, skunks, and weasels. A native of the slopes of the Himalayas, from Nepal east to China, the red panda usually spends the daytime asleep in the trees. It ventures out in the evening or at night to forage for its omnivorous diet: bamboo, leaves, flowers, and berries, as well as birds, eggs, and small mammals.